I’ve been busy over the past few weeks, watching a lot of hockey fights. Not exactly my favourite thing but necessary in order to collect some additional data on fighting, enforcers and the impact on Rat PIM. As always when you look beyond the general perception of an activity you get a better sense of what is really happening. The general perception is that fighting controls the rats and makes the game safer. The thinking is that players who have a proclivity towards cheap shots will play differently when faced with the prospect of a fist to the head. As I have demonstrated in past Rat PIM updates the data shows the opposite and this post won’t be a surprise either. Earlier this year I presented some analysis based on the Leafs previous season that showed a clear link between fighting and an increase in Rat PIM. The data only covered 48 games and for this post I studied all 212 games for the month of November. 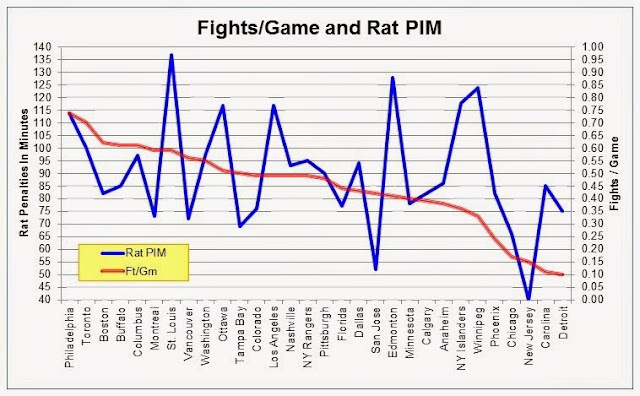 Remember the statistic Rat PIM is the combination of non-fight related penalty minutes and includes; Roughing, Slashing, Cross Checking, Elbowing, Major Penalties (excluding fighting majors), Boarding and Unsportsmanlike. Looking at two categories of games, those without fights and those with, you can clearly see that dropping the gloves is a sure way to increase the amount of cheap shots and dangerous hits. Although only approximately a third of the games had at least one fight, there were more Rat PIM in total in those games. The Rat PIM per game was also almost double when players dropped the gloves. The perception of NHL players, coaches and most general managers is clearly wrong when you look at the data. Enforcers don’t settle things down and the prospect of fighting doesn’t alter how a rat plays the game. For all games where there was a fight the NHL data clearly shows that Rat PIM was far higher after a fight had occurred, almost 300% higher. Far from controlling cheap shots or dangerous hits, a fight generally sparks more violence. That’s no surprise to anyone who understands competitive hockey. No player or team can allow themselves to be intimidated and will respond by playing more aggressively and sticking up for their teammates. That fact is pretty clear when you look at the total amount of games that had no Rat PIM called. There were a total of 31 games in November that did not have any roughing, elbowing, slashing, boarding or other penalties that make up the Rat PIM statistic. In 29 of those games there was no fight and only 2 games involved dropping the gloves. Remember that the next time someone tells you that fighting makes the game safer. Although I looked at every fight I did not make any attempt to classify them. The “passion fights”, the ones that fight fans wistfully remember and hope they never disappear, are rare and make up perhaps 10% of the bouts in November. The remainder seemed to be equally split between revenge and enforcers who are justifying their role by taking on his counterpart on the other team. Those observations are subjective of course but are based on my review of the combatants and the game situation that sparked the fight. I’ve made the point previously that if the referees used the instigator penalty as it is written then most of the revenge and staged fights would disappear quickly. Once again I have to report that the clear trend we saw most of last year is not as evident this season. There is a very slight trend that shows a decline in Rat PIM as fights per game decreases but enough anomalies exist to cast the data in doubt. We’ll have to wait and see how this develops over the rest of the ’13-14 season. Fights per game have continued to drop from my last update, from .52 in November to .45 as of December 28th. Rat PIM per game are also down over the same period, from 2.60 Rat PIM per game in the previous update to 2.31 as of today. Hmmm… fights per game drop and Rat PIM per game also drops. The one statistics that shows an increase is the amount of times the instigator penalty is called, now being used in 6.6% of all fights. Stats include all games up to and including December 28th. Rat PIM is the combination of non-fight related penalty minutes and includes; Roughing, Slashing, Cross Checking, Major Penalties (excluding fighting majors), Boarding and Unsportsmanlike. Very interesting point you make about the rat PIMs per game with and without fights, definitely a compelling argument. As you know, I am one of those who wistfully remember the 10% of fights that start from passion, and I'm starting to agree with you that it is worth losing those 10% to see the other 90% go away. I do have one question about your data though: was there any statistic about the time of the game the fights occurred in? Anecdotally, I would argue that many fights occur right at the beginning of a game or after an early goal, which will skew the rat PIMs before/after a fight heavily so they mostly occur after a fight. If its possible to weigh the time of the fight into the equation (theoretically rat PIMs should occur with equal probability at any randomly selected time of the game), we may get a clearer reading on the fight's impact on playing style. Finally, a statement about the fights/PIMs graph: a trend we have seen in past seasons is that teams with high fight numbers and high rat PIMs have an unsustainable model for success (see: 2011 Flyers). In that light, we will have to see if the Blues and Kings can maintain their winning pace toward the postseason. To me, this graph shows that teams like San Jose and Chicago have the highest chance for success in the postseason because they are winning a cleaner game (maybe the Blues are taking more rat PIMs because the Blackhawks are skating circles around them?). In the east though, the Bruins, Lightning, and Montreal have the lowest rat PIMs other than the Devils, are probably the teams to beat in the east (I think the Penguins will implode again, but that's an argument for another day). They all fight significantly more than the Sharks or Hawks though. On the flip side, the teams with the highest rat PIMs after St. Louis are Edmonton, the Isles, and Winnipeg, all of whom are not good teams. All fall in the bottom 11 of fights per game though. To me, the most accurate conclusion we can reach is "winning teams don't take rat PIMs, regardless of the number of fighting majors they incur." All that said.... we still have half a season left to play plus postseason, who knows what's left to come. Thank you for going through all those fights and posting all your findings. I haven't been commenting as much the past few months (work.... bleh), but I'm still reading all your posts.Your writing is always great to read, and I appreciate all the time and effort you obviously put into it. How sensitive are your Rat PIM results to the inclusion of unsportsmanlike conduct penalties? Anecdotally my experience is that these tend to accompany fighting penalties very frequently; I would not be surprised to learn that games with fights had high numbers of unsportsmanlike conducts, but this would tend to obscure any dampening effect of fights on the other Rat PIMs (if such exists). Are misconduct penalties also included in Rat PIM? Back in Black - Unsportsmanlike penalties are included in the RAT PIM totals. But these penalties are among the lowest called, on a percentage basis. Unsportsmanlike make up approx 1.5% of all PIM and only Instigator (0.3%), Holding the Stick (0.7%) and Goalie Interference (1.1%) are lower. In relation to fights, a Fighting Major is called 5.2 times for every Unsportsmanlike - so they are not that closely linked. Misconduct penalties that are not related to a Fighting Major are included in Rat PIM. If you fight and get tossed then those misconduct minutes are not added to Rat PIM.